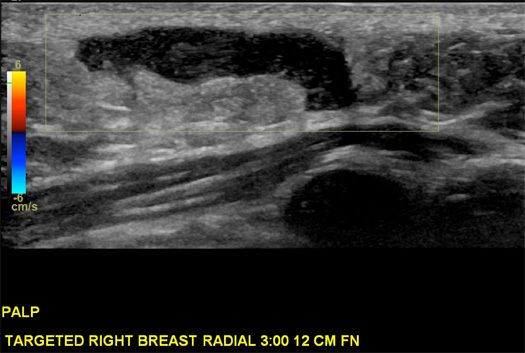 A 22-year-old obese woman presented for a workup of a palpable right medial breast mass and a palpable left axillary focal mass. According to the patient, the right breast mass was tender, waxed and waned in size, and had been present for about six months. It was located at 3:00 at posterior depth and was associated with a retracted skin track on physical exam. The left axillary mass was raised on physical exam and was associated with waxing and waning tenderness, according to the patient, who had been expressing fluid from the mass for about 12 months. On targeted ultrasound, the palpable right breast mass correlated with a cystic parallel mass, which was abutting the dermis and contained intrinsic echogenic material (Figures 1 and 2). A dermal sinus tract was visualized. 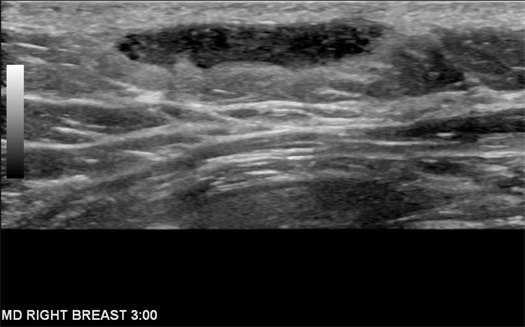 On targeted ultrasound, the palpable left axillary mass correlated with a complex cystic mass located just beneath the left axillary dermis and filled with internal echogenic material (Figure 3). HS, also known as acne inversa, is a chronic skin disorder characterized by recurrent development of tender inflammatory subcutaneous nodules, which occur mainly in apocrine gland-rich locations. Most commonly affected locations include the axilla, inguinal, anogenital, and submammary regions as well as the inframammary fold, chest, scalp, eyelid, buttock, and pubic areas. HS affects 1% to 4% of the population and is significantly more common in women in their early 20s, with disease prevalence declining after age 50. Smoking and obesity increase the risk and directly affect the severity of HS. One-third of patients report a family history of HS, with an autosomal dominant mode of inheritance identified. HS presents as recurrent comedones (blackheads when open, whiteheads when closed), abscesses, fistulous tracts, and scarring. HS begins with the occlusion of a hair follicle, followed by the dilation of the pilosebaceous unit, with subsequent rupture and spillage of its contents onto the surrounding dermis. This results in infection, abscess formation, and sinus and fistula formation. • Stage 1. Solitary or multiple isolated abscess formation; no scarring or sinus tracts; resembles acne. Early stage treatment includes topical antibiotics and estrogens. Intralesional injection of steroids is also used. • Stage 2. Recurrent abscesses, single or multiple widely separated lesions. Sinus tract formation. Oral antibiotics and anti-inflammatory agents improve disease severity. • Stage 3. Diffuse or broad involvement across a regional area with multiple interconnected sinus tracts and abscesses. Fistulation and scarring. Severe cases are managed surgically. Because lesions are likely to recur, incision and drainage is typically discouraged. Surgery typically consists of a localized excision of the sinus tract and abscess, or excision of all hair-bearing skin in an affected area with or without skin graft/flap reconstruction. Diagnosis of HS is clinical, and imaging is typically nonspecific. 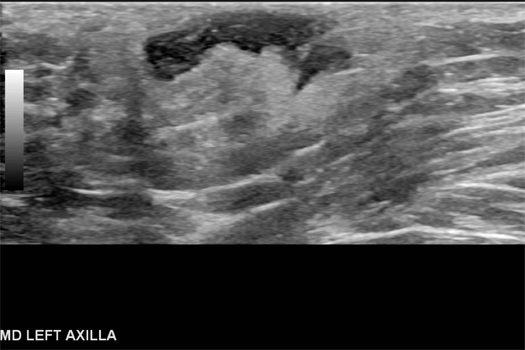 On ultrasound, an HS lesion consists of a dermal/subdermal fluid collection ranging from simple to complex. On MRI, features of HS include skin thickening, subcutaneous T1-hypointense lesions that demonstrate hyperintensity on fluid-sensitive sequences, and rim enhancement postcontrast within apocrine gland-rich regions. Short T1 inversion recovery is considered the most useful sequence. Lymphadenopathy is common. 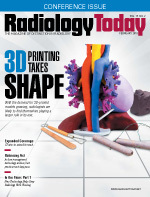 On imaging, HS may be indistinguishable from other inflammatory lesions of the dermis and epidermis including carbuncles, erysipelas (bacterial epidermal infection), and cellulitis (dermal infection). Other differential considerations include lymphadenitis and infected Bartholin or sebaceous cysts. These entities are distinguished from HS by response to treatment, whereas HS ultimately fails to respond. 1. Poh F, Wong SK. Imaging of hidradenitis suppurativa and its complications. Case Rep Radiol. 2014;2014:294753. 2. Napolitano M, Megna M, Timoshchuk EA, et al. Hidradenitis suppurativa: from pathogenesis to diagnosis and treatment. Clin Cosmet Investig Dermatol. 2017;10:105-115. 3. Denny G, Anadkat MJ. The effect of smoking and age on the response to first-line therapy of hidradenitis suppurativa: an institutional retrospective cohort study. J Am Acad Dermatol. 2017;76(1):54-59. 4. Sibbald RG, Mufti A. Hidradenitis suppurativa. CMAJ. 2015;187(16):1235.